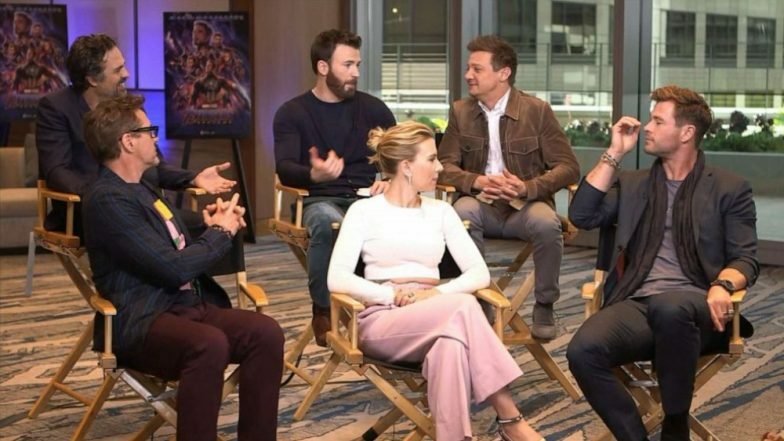 The cast of Avengers: Endgame stopped by Jimmy Kimmel Live! to bring about a less morbid end to Infinity War that kids would enjoy at home. Kimmel started the episode with “Grown adults left the theatre crying,” which is very true considering how some of the favourite heroes perished to dust. The story began with Mark Ruffalo reciting the story of "Twas the Mad Titan Thanos". It was followed by Scarlett Johansson, Chris Hemsworth, Don Cheadle, Jeremy Renner and Chris Evans. Calling Thanos a "naughty boy", Ruffalo laughed when he read how Thanos collected all the Infinity Stones for his ugly gauntlet. All the cast collectively took jibes at Thanos' chin looking like a pair of testicles. Evans, Cheadle and the others all commented on Thanos' chin. The Avengers on Jimmy Kimmel Live! Eventually, they all also blamed Thor for not hitting Thanos on the chest instead of the head. Johnasson and Ruffalo both stated how Thor blew it by making such a rookie mistake. Chris Hemsworth, though, added, “At least I got close enough to actually go for something, unlike the rest of the pathetic little useless —- Avengers.” It is a hilarious video, especially with the constant comments by the Avengers. Avengers: Endgame is set to release on April 26. The film stars Robert Downey Jr, Chris Evans, Scarlett Johansson, Mark Ruffalo, Chris Hemsworth, Brie Larson, Jeremy Renner, Josh Brolin, Don Cheadle, Karen Gillan, to name a few. Avengers EndGame: Robert Downey Jr the Only Marvel Star to Get the Full Script, Reveal Russo Brothers, and We Are Hardly Surprised by That! KKR vs RCB Head-to-Head Record: Ahead of IPL 2019 Clash, Here Are Match Results of Last 5 Kolkata Knight Riders vs Royal Challengers Bangalore Encounters! IPL 2019 Today's Cricket Match Schedule, Start Time, Points Table, Live Streaming, Live Score of April 19 T20 Game and Highlights of Previous Match!